Born in Hudson, New York Phillips displayed his artistic talents early, winning art prizes as a child. He trained formally at the New York City Art Students League and the National Academy of Design, maintaining a studio in the city as well. In 1894, he moved to England to work on his watercolor landscapes. The next year he studied in Paris at the Julien Academy. There he met Ernest Blumenschein and Joseph Sharp. In 1897, he was back in New York City sharing an apartment with his new friend, E. L. Blumenschein. The following year the two artists made a sketching trip to Colorado and through a series of events they landed in Taos, New Mexico. Phillips decided to stay in Taos having fallen in love with the land. 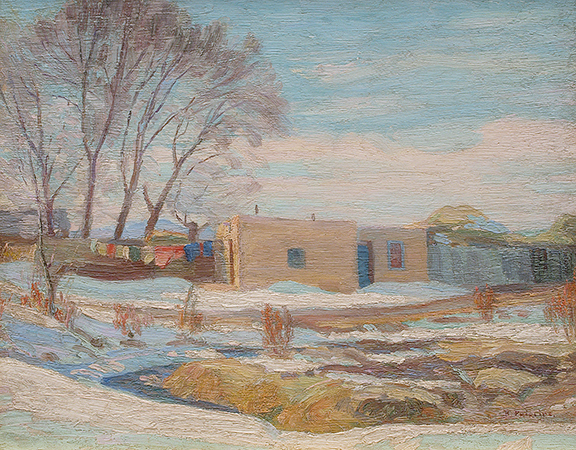 He became the first permanent resident artist and the key founder of the Taos Society of Art formally founded in 1912. His works are in the Anshutz Collection, Museum of New Mexico, and the Gilcrease Institute.